In November of 1864, the United States Military Railroad’s car shop in Alexandria, Virginia began construction of a new official railcar for President Abraham Lincoln. When it was completed a few months later, the new car, dubbed the “United States,” was considered the most opulent private railcar of its day. 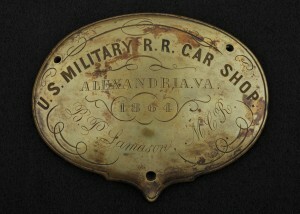 This brass builder’s plate from the Wisconsin Veterans Museum’s collection once served to identify the car’s origins as well as credit B.P. Lamason who oversaw its construction. Due to the tragic events that unfolded shortly thereafter, however, Lincoln did not live to see Lamason’s creation. Instead, his personal car assumed the solemn task of transporting his body back to Springfield, Illinois following his assassination, its one and only official trip. Following the two-week, nearly 1700 mile funeral procession and the soon-after disbandment of the nation’s military rail program, the “United States” was sold to the privately-run Union Pacific railroad. While the lavish car served well to transport executives during the building of the transcontinental railroad, it outlived its usefulness when the line reached completion a few years later. In the early 1870s, Lincoln’s car was sold to another railroad company and stripped down, a move that began its unfortunate spiral into disrepair. B.P. Lamason, master car builder and project superintendent, was also personally in charge of the car during its funeral procession to Springfield. Nearly derelict, the car was returned to Union Pacific in the 1890s. F.W. Oakley, a Civil War veteran from Beloit who served with Co. K of the 7th Wisconsin Volunteer Infantry Regiment, worked for Union Pacific after the war and had followed the history of the car with interest. When he learned that Union Pacific planned to scrap the car after being exhibited at the 1898 Trans-Mississippi Centennial Transportation Exhibit in Omaha, he removed this plate and kept it as a personal memento. The “United States” photographed by Andrew J. Russell in Alexandria, January 1865. Image from the Library of Congress, LOT 11486-C, no. 3. On March 18, 1911, the once-luxurious railcar met its final end in a prairie fire in a farm field outside Minneapolis, where it had only recently been refurbished and promoted to the public as the “most sacred relic in the United States.” Recognizing the plate’s historical significance—one of the few extant objects to remain from the original train car—Oakley donated it to the Memorial Hall collection at the State Capitol before his death in Madison in 1925.